Rachel Hollis: Hi. I'm Rachel Hollis, and my latest cookbook is called Real Life Dinners. 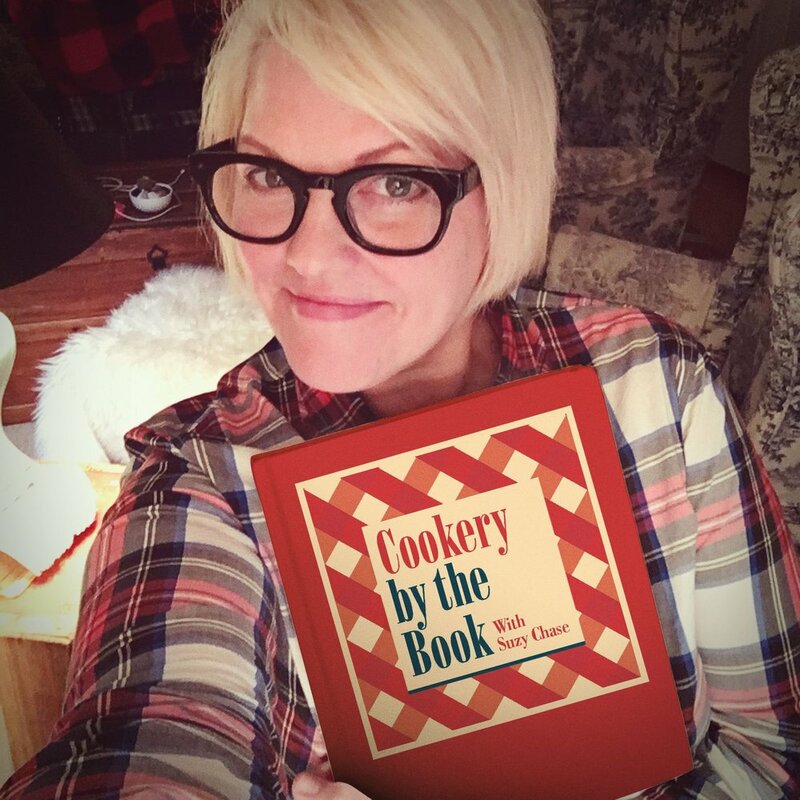 Suzy Chase: I just have to say that you're my very special 100th episode guest, and I can't thank you enough for coming on my podcast again to talk about cookbook number two. You're the co-CEO of The Hollis Company, an entrepreneur, a motivational speaker, social media influencer, mom of four, wife to Dave, and a New York Times and Amazon best-seller. Now, you show us how to handle dinner in your new cookbook Real Life Dinners. It's one of those cookbooks for real life. Now, how has dinner played a pivotal role in your life? Rachel Hollis: Well, dinner is one of my favorite, no, it is the favorite meal, and so many of the best memories in my life happened around a dinner table. Sometimes that dinner table was my own. Sometimes it was my grandmother's sometimes it was a little table somewhere in Italy when we were on vacation, but as I started to dream of what the next cookbook would be, I really wanted to celebrate the meal that I loved the most, and I also, as a mom of four, dinner is what I'm constantly trying to figure out. It's the only meal that I really cook. I mean, sometimes we do breakfast on the weekends, but I'll be super honest and tell you that more often than not, it's Cheerios or toast or waffles, but dinner is where I really, my heart is there. I really put a ton of effort into making sure that we're eating good dinners. I thought, I can't be the only woman who's trying to figure this out. When I buy cookbooks, that's the only kind of cookbook I buy is things that are going to help me get dinner on the table, and I just wanted to show my own. Suzy Chase: You wrote in the introduction, "Sometimes I'm so busy working on ways to help other women live a better life than I run out of time and my kids eat turkey sandwiches, or worse, just straight up turkey rolled around a piece of string cheese for dinner." What is your planning strategy so this doesn't happen? Rachel Hollis: My favorite practice that I've adopted in the last couple of years is prepping for my week on Saturday or Sunday. It's a really fantastic way to meal prep. I take the time, I figure out what are the lunches and snacks that I want to be able to take to work with me during the week or that my husband wants for breakfast. I prep those, as well as figuring out what we're going to have for dinner on that Sunday. I'll do all my grocery shopping, and I'll get the stuff that I'm going to prep as well as the things that I want to make for dinner later in the week. That way, if I'm going to, let's say, marinate some steak or do something that requires a little prep work, I'll get it all done then so that when Tuesday rolls around and I'm going to grill up that meat for Dave, it's ready to go, and I've done it in advance. I'm trying to take as much work out of the process as I possibly can to ensure that we're, frankly, eating healthy because I can get dinner on the table for you all day long, but when I'm in a hurry or I'm in doubt, I'm going to reach for things that aren't as great a choice for what we're eating. I'm going to reach for stuff that's probably really carb-based and taste delicious, but doesn't help us stay in a healthy way of life. I found that by prepping, I remove a lot of the stress from my life, as well as I feel better about what I'm feeling my family. Suzy Chase: It's funny because one of your mottos is "we're not going to have a dream, we're going to have a plan." I guess that translates to cooking too. Suzy Chase: ... and with some cheese. Rachel Hollis: Yes, exactly, but I'm way more likely to succeed with a plan that I've set for myself if I'm intentional about planning for it. Suzy Chase: Describe the progressive photos that come with each recipe in the cookbook. Rachel Hollis: The idea of showing step-by-step photos has been a part of any recipe I've created since the very beginning. I actually got my start in this space as a food blogger, which is very surprising to a lot of people because that isn't as much what I do now. I'm much more known for motivational speaking or writing books about hopefully making choices to change your life for the better, but I got my start as a food blogger, and when I first started, most of my audience were not people who felt super comfortable in the kitchen. The step-by-step photos were just my way of trying to ensure that you knew exactly how it was supposed to look at each stage. I try not to take for granted that you know what it's supposed to look like when it's mixed up or that you know the texture of that piece of meat when it's medium versus well-done. The photos are my way of trying to help you along. I think as a blogger, I was always so mindful of the idea that if you failed when you try something new, if you try a recipe or a craft, and you fail at it, it's probably my fault as the writer or the blogger for not explaining it to you in enough detail, but the problem is you don't blame me, you blame yourself. Rachel Hollis: When you blame yourself for failing at something new, you're not likely to try it again. I've been really intention with wanting to be very explanatory when we do anything to make sure that you understand. From a cookbook perspective, you'll see this a lot, there are plenty of cookbooks where only a certain amount of the recipes even have a hero shot, and very few have hero and, a hero is the big, beautiful shot at the end, in case listeners don't know, but very few have the hero shot as well as the step shots. Even though it's much more expensive, that was a must-have for me because if you've learned to follow along my recipes, that way, I want to make sure you have what you need to succeed. Suzy Chase: It's funny that you just mention it, because I just realized how often I have to Google what it looks like that I'm making out of a cookbook because there's not a picture with it. Rachel Hollis: Yes. You need to know, especially even if you are a cook, if you've not done that recipe before, you're like, "I don't know ... Is this supposed to have grill marks? Is this supposed to have a char?" I think it really helps you, even if you are familiar, you feel comfortable in the kitchen, it really helps you to get to that end-result that's most ideal if you have a visual of where you're headed. Suzy Chase: One busy mom move is to throw together brinner, breakfast-dinner, and you have a whole chapter devoted to it. Talk about how having something for dinner that's not really dinner makes it feel special. Rachel Hollis: I think ... This is something that felt always special to me as a little girl was getting to eat something when you weren't supposed to be allowed to eat it, if that makes sense. The story I tell in the book is being a little girl and going to dinner. We're on a family road trip, and my mom let me order a milkshake for dinner. Frankly, I think she's just so tired of four kids in a car and a long trip that she's like, "Man, get whatever you want. Just please stop screaming," but I got to have a milkshake for dinner. I still remember that 30 years later how special it felt. For me, having breakfast for dinner, like if we do waffles or pancakes or we have eggs and bacon, it always feels like a treat for our family. Rachel Hollis: Because I feel like, "Hey, I'm not for everybody, and that's fine," but the other day, I happened to be on Amazon. I was looking at something for the cookbook. I was trying to get the link for it to post on social, and I just happened to see something that was like two stars. I was like, "No," and then thought, "Well, I have to read. I have to see what she said. I'm not ... I'm human. I want to know what she didn't like." The thing she didn't like about this cookbook, which I think is important to tell your listeners, is there's a lot of storytelling. For me, because I write fiction and because I write nonfiction, my fan's favorite part of the book is the story behind it. Why did you cook this? Why do you care about this thing? When did this show up in your life? This woman was like, "There aren't ... I don't want storytelling. I want the straight recipe. This feels like a waste of my time." I thought, food, and especially dinner, it isn't just the food. It's the experience. I never wanted to give you just the recipe. I wanted to tell you why this was meaningful and powerful in my life. Suzy Chase: You have one brinner ... It's so funny to say that, brinner. Rachel Hollis: Yeah, that's what we called it. Suzy Chase: You can make your breakfast strata on page 34, let's say, on Sunday, and then you can serve it on Monday night for dinner, so that goes along with your meal prep philosophy too. Rachel Hollis: Yeah, and there's a whole section in the book of ... I don't know if you've ever seen Steel Magnolias, but it's always what I think of something that freezes beautifully. There's a whole section on food that you can prep in advance or you can marinate and throw in the freezer and then thaw it later because, again, this is real life. None of these recipes require a ton. You don't have to prep things in advance, but if you're busy like I am and that's helpful to your life, we want to make that as easy as possible to achieve. Suzy Chase: Do you have a favorite go-to summer recipe in this cookbook? Rachel Hollis: There's an entire chapter on grilling. That was really intentional because during the summer, we are just grill fanatics. We were grill fanatics in California, but I will tell you that we moved to Texas about a month ago, and it is just hotter than heck here. I mean, people told me it was going to be hot. I didn't really understand, and now, I'm like, "Okay, I got you," so we've been grilling almost every night. The one that I keep coming back to over and over because I eat fish, I don't eat meat, is there's a cedar plank salmon recipe in the book that I love. I use a spice blend in the beginning of the book. It's four of my spice blends that you can create in your own kitchen. It is a Moroccan Spice Blend that I put all over that salmon and then put it on a cedar plank. It cooks so easy. I feel like it seems like a scary recipe because you're like, "What is this wood that I'm incorporating into my grill," but honestly it is kind of the most foolproof fish that I think you can do anywhere, on the grill or even sauteing or baking or whatever. That's a favorite. I've been making it over and over and over. But I also think the whole grill chapter, I'm not trying to toot my own horn, but I'm really proud of the grilling recipes in it because there's everything. There's fish, and there's meat, and there's vegetarian options. If you're having a cookout this summer, I feel like it's a winner. Suzy Chase: Speaking of spice blends, you are obsessed with spices and have, as you said, four spice blend recipes in this cookbook. Describe the Fiesta Blend, and what can we use that on? Rachel Hollis: I really ... When I was younger and didn't know as much about cooking, let's say I was newly married, spice blends gave me courage and gave me confidence because I didn't feel confident enough in the kitchen to think, "Oh, I could put a little cumin on this and maybe some garlic and some salt." I didn't know enough about flavors to make my own thing. I would go to the store, and I'd say, "Well, I'm going to make fajitas, and so I'm going to get Fajita Mix or I'm going to get a Fiesta Mix, and that's going to have the flavors that I need." The thing with spice blends is that they can be really expensive, and so I thought, well, could I give people a recipe for how you could use spices and herbs that are already in your cabinet and mix them together to make a blend. The Fiesta Blend is something you can use on anything that has a little bit of, needs a little bit of Latin flair, and that can be anything from your meat, your fajitas, your tacos to eggs. I think they all work really well. I wanted to give something that was a different flavor palette for no matter, no matter what you were cooking, you had something that you could use. Suzy Chase: I think I remember last winter, you went to Kansas City, which is the reason I remember this is because I'm from Kansas City, to meet about developing your own spice blend. Rachel Hollis: Yes. You're so right. Originally, the spice blend were blends that I was using. I thought, "I'm going to create these things, and then I'm going to sell them." To be totally honest with you, I just came off an appearance on QVC with my first cookbook. I've done so much TV over the years, and QVC just felt like this magical pairing of my skill set, like, oh, I know how to be on camera, and I also know how to have a product that I think other women will like, I should develop my own. I started to work on the spice blends, and to be honest with you, it was such a long process. It was start and stop and start and stop, and what really ended up taking me out of the process was not the length of time, was that I was really struggling to create something that would last on shelves but that wouldn't include chemicals that I didn't want to put in my food. Rachel Hollis: I personally stay away from things ... If there's something in your ingredients that you can't pronounce, it's probably not good for you. A lot of what are in spice blends are things that they put in there so that they don't cake. If you've ever had spices where it gets clumpy, it probably doesn't have these agents in it to keep them from caking. Rachel Hollis: There was a massive difference between one and the other, one with and one without. I just thought, I just can't do it because I've talked so much to people about how much I try and make sure my kids aren't taking in things that they don't need, and I was like, "Oh, you're going to be a hypocrite," so I decided to just make the spice blends available to you in the cookbook. If you notice, the blends are done in small batches. That's so you could use up what you got there without it having to sit for a really long time on your shelf, which means it's not going to cake, and it's still going to give you those flavors that you want, but it's in your own kitchen in a little mason jar. You can keep it on the cabinet, and you're ready to go. Suzy Chase: Well, frankly, I think that's smarter too because we have those spices already in our kitchen, so we can make a little batch. I think that long process, going through trying to make your own spice blend brought you to that. Suzy Chase: Last week, I made your recipe for tuna stuffed avocados on page 154. Suzy Chase: It was so fast to make, and filling, and I loved the basil. Tuna is one of those foods that you can have more than once a week, and it's so versatile. Rachel Hollis: Absolutely. In fact, when I meal prep on Sundays, I almost always make tuna salad because it can sit in the fridge for several days, and I can have it for lunch, or in a pinch, I can throw it in an avocado like in the cookbook, and I've got something to fill me up. Again, my protein of choice is fish, so it's a great option for me. My kids will eat it. My husband will eat it. I think I'm always trying to come you up with new and different ways to serve the same kind of things, and adding in something like basil just gives it a different flavor that you're used to, but I think it's so yummy. Rachel Hollis: So many things. Suzy Chase: ... lately. So many. Rachel Hollis: When I first started as a blogger, I mentioned earlier, I started as a food blogger, and honestly, my career as a blogger has really just followed me as a woman. Five or six years ago, I was trying to figure out how to feed toddlers. I was trying to figure out how to make dinners for my husband and myself that our kids would eat. I was doing food blogging because that's the stage I was at in my life. Later in my career, I started to focus on DIY and how to decorate a home because we had a new home, and I wanted to decorate it. I really have just organically brought my audience along for the ride. In the last few years, I've done a ton of work on personal growth and how do I get past some of the things that I'm dealing with like anxiety. As I was walking through those seasons, the audience started to ask, like, "Hey, how did you get past that? How did you learn to do this? How did you set a goal and achieve it?" I started to share my process with them, and it really has just grown, again, organically into what the business is today. We are The Hollis Company. My husband actually just left a really big job to come and help me run this thing that has just exploded, which I will tell you, Suzy, back in the day, my intention, we wrote it down on the wall, was to give women the tools to change their lives. Rachel Hollis: ... and now, giving you the tools to change your life looks more like how to be intentional and how to have a gratitude practice and how to be kinder with yourself. I had a book come out in February called Girl, Wash Your Face, and the response to that book has been the most incredible, sometimes overwhelming, but the most incredible experience of my professional career. It has just exploded, and as it exploded, it really opened up the fan base and gave us more women who wanted more content, and so that's what we do. We have personal growth conferences, both for women by themselves and in couples, and we made ... This sounds crazy, all the things that we've done, but when we were producing our conference this year, I had thousands and thousands of emails from women all over the world who were saying, "I want so badly to come to the conference, but I can't afford it. I can't afford the travel." I really started to dream about how we might be able to bring them the experience of one of our live event weekends without the expense. The answer to that was we made a documentary about the weekend. It will be in movie theaters in August 2nd throughout North America, so it's in both the US and Canada, and you can go to letsrise.co, which has all the information about the movie and our live events if you're curious, but it's a way to check out what we do and see the magic and the power of going to a personal growth conference for the cost of a movie ticket, which is about 13 bucks. We are really, really excited and proud of what we've built and are continuing to build. It'll be fun to see what happens next. Rachel Hollis: Aw, thank you. Suzy Chase: ... I'm getting together a big group of girls here in New York City to go see it. Rachel Hollis: How fun, and that's what we're hoping honestly. The most incredible thing about this online tribe that we have created is the community of women. It really is what makes our live event so special is we say from the stage, there is nobody here who doesn't have a friend. If you see a woman standing by herself, she just became your buddy. Nobody sits alone. We are all going to do life together. There is something that happens. There's an energy that happens in that space when women from every walk of life are really intentional about, "Hey, let's go grab a glass of wine," "Hey, let's go talk about this," "Hey, let's go have lunch," because you find commonality in people when you didn't think you had anything in common. I'm super excited to hear that you guys are going to go in a group because I really think that is the best way to experience this particular event. Rachel Hollis: I'm all over the place. I'm on every place you could possibly find me, but my favorite to hang out is definitely Instagram. I love Instagram. It's so pretty, but my handle is @msrachelhollis, M-S Rachel Hollis, and then I'm Rachel Hollis on every platform that there is. You can find me anywhere you go. Suzy Chase: From a girl growing up on Weedpatch Highway to a super popular lifestyle expert and CEO, you are such an inspiration, and I'm so honored to have you on my hundredth cookbook podcast. Thank you so much, Rachel Hollis, for coming on Cookery by the Book podcast. Suzy Chase: Subscribe in Apple Podcasts, and while you're there, please take a moment to rate and review Cookery by the Book. You can also follow me on Instagram at CookerybytheBook. Twitter is @IamSuzyChase, and download Your Kitchen Mix Tapes: Music to Cook By on Spotify at Cookery by the Book. Thanks for listening.